Grand Ole Opry and Bluegrass Hall Of Fame member Bobby Osborne. 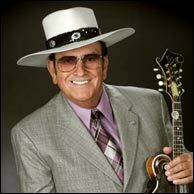 Bobby Osborne has been a member of The Grand Ole Opry since 1964 and inducted into The Bluegrass Hall Of Fame twice; once as The Osborne Brothers and once as a member of The Lonesome Pine Fiddlers. He's recorded some of the biggest songs in Bluegrass history including Rocky Top, Ruby, Kentucky, Midnight Flyer and literally hundreds of other songs. As a songwriter he's written With A Pain In My Heart, Memories, Son Of A Sawmill Man Windy City, Big Spike Hammer, Midnight Angel and scores of others that have gone on to be essential parts of the Bluegrass repertoire. Along the way, Bobby has been one of the most innovative and influential musicians and singers of the Twentieth Century. Bobby started his career in the late 1940s playing electric guitar and singing on the radio in southwestern Ohio. He met Larry Richardson, an early Scruggs-style banjo player, and Bobby became an acoustic guitar player and lead and tenor singer. When Bobby teamed up with Jimmy Martin, Bobby became a mandolin player. Bobby knew that with his singing and mandolin playing he wanted a sound of his own. He loved the sound of Bill Monroe and the Blue Grass Boys, but he knew that originality was a huge factor in having a career as a professional musician. He was the first mandolin player to create a style not based on Bill Monroe's style and drew on his background as an electric guitar player and his love for the fiddle to forge his style. Bobby is a real student of the fiddle, and has closely watched and learned the bowing of his favorite fiddlers. When you watch him play mandolin, you're initially struck by his right-hand technique. He's based it on the fiddle bow. So if a lick is played with an up-bow, Bobby uses an up-pick. You also hear in his phrasing the influence of the best electric guitar players of the 1940s to 1960s. You also hear Bobby's sense of phrasing and dynamics and melodic structure that he employs in his singing. Owen Bradley produced the Osborne Brothers biggest records and used the Nashville A-Team musicians on their records. Bobby and Sonny learned a lot of music by working with Grady Martin, Ray Edenton, Pig Robbins and others at Bradley's Barn and The Quonset Hut. The synthesis of the Osborne Brothers ground-breaking harmony, innovative musicianship, and the studio players of the day produced a sound that was both musically incredible and commercially successful. Those records sound just as modern today as the day they were recorded. Bobby's played literally every major venue in North America and around the world from the White House, to Carnegie Hall, The Grand Ole Opry and to the concert stages of Europe and Asia. At this point in his career, Bobby is making some of the most important and vital music of his career. His most recent recording is a celebration of his 60+ years in the music business. Though a Country Music legend and a Bluegrass icon, he continues to play and sing with the same drive, focus and enthusiasm of the young man who picked up an electric guitar and sang Ruby on an Ohio radio station those many years ago. Listen to Bring Back Yesterday from Bobby Osborne's newest recording with The Rocky Top X-Press, Memories, Celebrating Bobby's 60 Years As A Professional Entertainer. Questions from F5Loar: You are one of the few pros to play a mid 20s Fern F5 and a 1924 Loar F5 with Virzi for a long, long time. Can you tell us what you think the differences between the two are other than the few years of being made from each other? Bobby Osborne: I think the Ferns and the Loar mandolins are probably all good with some better than others which is true in other things as well. I just like the Fern better than the Loar. I think the difference between the two is mainly the wood and where it came from and the man with the pick in his hand. 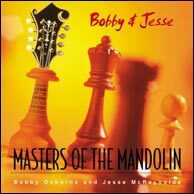 Masters of the Mandolin - Bobby Osborne and Jesse McReynolds from 2001. Click to purchase. Questions from F5Loar: In the 90s Gibson was to come out with an Osborne signature model Fern F5. Only a few prototypes were made. What happened that this model did not make it to production? Bobby Osborne: Gibson had promised to build a Bobby Osborne Model before the move to Nashville. It was still to be built after the move but personnel changes etc. got in the way and it was never mentioned again. As far as the prototypes, if any were made I never knew about it. Questions from F5Loar: At the 1966 Roanoke Festival in Fincastle, Virginia, you and Sonny sung I Hear A Sweet Voice Callin' with Bill Monroe. I recall it was the first time you and Bill Monroe had sung together on stage. I remember Sonny cried with emotion at that moment you two hit the high harmonies together. What did you experience that day for that moment? Bobby Osborne: I learned that day that Bill Monroe had the same respect for me as I had for him. At The Grand Ole Opry I shared the same dressing room with him the last 15 years of his life and we were great friends with much respect for each other and what we had each done for Bluegrass music. Editor's note: John Byrne Cooke captured the Osbornes in a series of photographs from 1963 and graciously agreed to share his memories of the day in the comments that follow. The venue is the Club 47 Mt. Auburn in Cambridge, Mass., at 47 Mt. Auburn Street. The year is 1963, date not certain, possibly May. Later in 1963, the club moved to Palmer Street, where its successor, Club Passim, is still located. After the move, the 47 was known simply as Club 47. When the Osborne Brothers and Benny Birchfield (on guitar) came to play at the Club 47 in 1963, I was in the Cambridge-based old-time and bluegrass band the Charles River Valley Boys. We had Osborne Brothers LPs and we had probably already included some of their early songs in our repertoire. We did She's No Angel, It Hurts to Know, and Once More, and we added more songs later on. Seeing the Osborne Brothers live was a great treat. We admired Bobby's incredible mandolin playing and the humor in Sonny's banjo playing—he was always having fun, and he was one of the very few banjo players (Earl Scruggs was another) who could play slow as smoothly as he played fast. What really blew us away about the Osborne Brothers were their three-part harmonies. For me it's the harmonies that make bluegrass, and no one was better than the Osborne Brothers, especially in the songs where they would slow down the endings and go through a series of shifting chords in the harmonies. We liked that style so much, we added what we always called "Osborne Brothers endings" to some other songs we did, including the bluegrass classic Don't That Road Look Rough and Rocky." A few months after the Osborne Brothers played at the Club 47 in Cambridge in 1963, New England's own Joe Val joined the Charles River Valley Boys and he played with us until the group scattered in 1968. Not too long after that, Joe formed his own band, the New England Bluegrass Boys. When Joe sang lead with the CRVB, his piercing tenor was so high that we did what the Osbornes did with Bobby's leads, we put two harmonies below him, myself (baritone) and banjo player Bob Siggins (a lower tenor than Joe), but when I sang lead, we did the reverse, stacking two harmonies *on top* of the melody, which produced a different kind of unique sound. Editor's note: During the image selection process John sent the following photo contact sheet. We asked for and were granted permission to share this rare glimpse into the images he captured during the Osborne's appearance. Click to enlarge. Question from sgarrity: Bobby, thanks so much for agreeing to this interview. Over the years I've heard other people refer to your mandolin style as "fiddle style" playing. I think your style of playing is more emulated than ever by the younger generation of players. When you were starting to play and forming a band, did you make a conscious effort to have a sound different from Monroe? How did your style develop? Bobby Osborne and The Rocky Top X-Press, Bluegrass and Beyond, 2009. Click to purchase from BobbyOsborne.com. Bobby Osborne: I always wanted to play the fiddle and because of my (and still) interest in the fiddle naturally I leaned toward the fiddle and you can hear that in my playing as well. I always admired Monroe's style of playing. Like many other players I tried to play his style but I learned at an early age his style of mandolin playing was only for him and came to be known as Monroe Style as mine has become the Bobby Osborne style. Questions from Mandolin Mick: I enjoyed your show at Bean Blossom in June. I was curious, of what are you the most proud? Rocky Top becoming Tennessee's state song, your career with Sonny, something you wrote, or something else entirely? Bobby Osborne: I'm proud of many things but I'm more proud of the voice given to me and has made me one of the most different voices in Bluegrass and Country music. Question from grassrootphilosopher: The Osborne Brothers sound was defined by a high lead with the other harmonies below. How did this vocal style develop? Has there been a change in the harmony approach in the Rocky Top X-Press? Bobby Osborne: The Osborne Harmony sound was actually created riding along in the car but later on we learned the pedal steel guitar had the same type harmony with the high lead on top. But as far as I know within my own self it was first done by us riding along in a car. 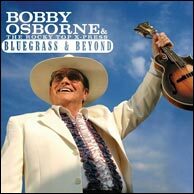 My latest CD Memories will prove the Osborne Harmony still exists with Bobby Osborne and the Rocky Top X-Press. As referenced in the Tennessee Blue Book under subsection "Tennessee Symbols And Honors." Question from dasspunk: Hi Bobby. The Osborne Brothers recordings contain some of the greatest song arrangements in the known universe (and almost certainly beyond), especially regarding endings. I've always been curious how y'all went about arranging songs and came up with such great endings... and might you have any particular favorite(s)? The Osborne Brothers at the Newport Folk Festival with George Shuffler on guitar. Exact date unknown but thought to be mid-1960s. Question from Ivan Kelsall: Hi Bobby - Many thanks for being on here and allowing us the privilege of asking you a few questions. The very first Bluegrass record I ever heard by the Barrier Brothers had drums on it. The very first Bluegrass LP I ever bought - Bluegrass Music by the Osborne Brothers (I still have it) had drums on it. There were other bands using drums at that time as well. What was the thinking regarding drums in Bluegrass back then? Bobby Osborne: We started out with only a snare drum for rhythm and when my son Robby learned to play the whole set we went with that. 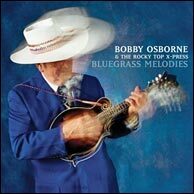 Bobby Osborne and The Rocky Top X-Press, Bluegrass Melodies, 2007. Click to purchase from BobbyOsborne.com. Question from Rex Hart: I saw you in Davenport, Iowa, in about 1972 or '73 when you were opening for Merle Haggard. You guys were playing plugged in at the time. Did you catch much grief from the bluegrass community when you did this and what do you think of using pick-ups now? Bobby Osborne: We caught lots of slack from the die-hard Bluegrass fans but with the Merle Haggard show it went well. I have nothing against pick-ups in fact I'm thinking strong about going back to one myself. Question from swampstomper: Not a mandolin question, but for vocalists: how do you keep your voice so sharp for so long? I would think that singing so high night after night, sometimes in cold and wet conditions at festivals, would damage the vocal chords. Do you have a "secret remedy" to keep your throat clear? Related to this, how do you get so much power at the top of your vocal range? Obviously you are blessed with a wonderful voice, but perhaps there are some techniques us lesser singers can use. Bobby Osborne: The main thing is learning to take care of your voice and this is not written in books. It's something you have to learn on your own time. Your voice will always tell you when you have abused it. The only secret remedy is within yourself learning how to take care of it such as trying to sing with colds, smoked filled places, of course alcohol, tobacco, and so many other things to be aware of. I find the best thing is just plain water in keeping your vocal chords moist as much as possible. I also I have a voice Doctor I go to pretty regular. Monroe was still singing at age 84. I'm 79 and still singing so good luck. Two essential recordings for fans of the Osborne Brothers from Germany's Bear Family Records: The Osborne Brothers, 1956-1968 (L-R on album cover: Sonny Osborne, Benny Birchfield and Bobby Osborne); The Osborne Brothers, 1968-74 (L-R on album cover: Bobby Osborne, Robby Osborne, Dale Sledd and Sonny Osborne). Question from AlanN: In an old publicity photo, you had a perfectly round pick stuck in the strings. Do you still use a round pick? And thanks for all the great tunes and playing! Bobby Osborne: I just played with a pick until it wore off round and got another. That photo just so happened to be taken with a round pick I had used that day. Thank you for asking. Question from SternART: I've always enjoyed your style of mandolin playing, and admire the fact that you have carried on without your brother, upon his retirement. Was that a difficult transition for you? Bobby Osborne: It's always been very hard for brother acts to carry on by themselves. Life goes on any way. I didn't want to quit at the time of his retirement so I moved on to another phase of my life and it's turned out good for me. In closing I want to thank the Mandolin Cafe for hosting this interview and to all you fine folks asking the questions and reading this. It was an honor for me to have been asked to do so. My new CD Memories, celebrating my 60th anniversary singing Bluegrass and country music is available on Rural Rhythm Records and can be purchased from my web site. I also want to thank my many fans around the world for their support they have given me through the years. I hope to be around a few more (years). Main instruments: The mandolin I play is a 1925 Gibson F-5 Fern. I purchased it from Charlie Bailey in late November of 1954 while working in Detroit. I've played the same mandolin all these years. String preferences: I use my own Bobby Osborne Endorsed GHS Phosphor Bronze Strings. Picks: I use what is called a tear drop pick. Microphone preferences, studio and live: Whatever is available! A classic Osborne Brothers LP cover from 1969, Favorite Hymns on Decca. Rare, but still available for purchase in LP format from various web sites. This is about the funkiest and funniest interview in a long, long while. Yet it is VERY interesting. I really love these interviews. What I thought was strange at first glimpse was the shortness of the answers. There seemed not a lot of information there. But when you reread them and maybe read between the lines and if you have a little background on music, the answers give you an interesting picture. Probably the best answer was the answer to swampstompers question about how to take care of your voice. That was very insightful ( for example concerning alcohol, tobacco etc.). The funniest answer was the "rounded pick" answer. Oh boy, just forget about most any pick brand and play yours until it's round! yep, reminds me of Monroe's quip: "I use this kind!" Scott, another home run. What a treat it is to hear from the horses' mouths their reflections on their careers and such. Thank you again.....still the best site on the web. Bobby, Sonny and Red Allan came up with the 3 point harmony using high lead and the other 2 voices below that. As Red told me I believe the tune was "Once More" while traveling on some road in West Virginia. Even then Red was still pissed he never got any credit for that. A little disappointing that the audio and video clips were mostly of Bobby singing. Very little mandolin. Did enjoy the singing though. I've said it before and I'll say it again ... Bluegrassers are the friendliest and nicest of musicians!!! I was surprised by the answer -- of course I realized that tobacco would be a bad idea for a tenor singer with a pure voice (as opposed to someone like Ernest Tubb) but I thought Bobby might have a secret elixir of herbs and honey with a little brandy or something like that. I have a stash of Croatian homebrew slibonic (plum brandy) that sure clears out the throat. Bobby's answer made me curious about what his throat doctor does, and when he sees her or him. I suppose as a professional he consults the throat doctor regularly. This reminds me of some pickers I played with many years ago. Very old-school, not concerned with equipment, other than Gibson mandolins and banjos, and Martin guitars. That was before the internet turned us into obsessing on every musician's equipment lineup. Seems like this would be an epiphany to a lot of us. Just play what you want, with whatever picks and strings you want, and make it sound like what you want. Never mind what everyone else is using. If Bobby had copied Bill's style, he never would have been as famous! You took the tune right out of my mandolin, Fred. Was gonna say the same - Bobby is old school and has been on the scene longer than many of us have been on the planet. The fact that there is an 'Osborne' style speaks volumes. Have been listening to Bobby And His Mandolin on the CMH label lately. Varied styles, tunes deftly played and all very musical. He happens to have a dandy mandolin or 2, but he makes the music, don't he. In one interview, I remember him talking about Unicorn mandolins, praising the workmanship and neck. I grew up in Dayton, Ohio, and remember when Sonny and Bobby would hit town and play locally. I was 15 then and far too young to be allowed in a place that served hard whiskey but the owner knew how much I loved Midwest Country/Bluegrass and let me sit where I wouldn't be seen. I'm 62 now and carry the kindness of that barkeep and the memories of listening to the "Brothers" along with so many others. Thanks to all of you. Marvellous, again. Thanks Scott for making this series possible. I showed the "Rocky Top" video to some pals a few days back....some friends with whom I pick and play, and with whom I also tackle "Rocky Top". They hadn't seen the Osbornes do it, and were in somewhat stunned silence afterward. It puts a whole new dimension on something familiar to see it done by the originators. Great interview, my favorite part was f5loar's question about the first time they sang "I hear a sweet voice callin" with Bill Monroe. This is one of my favorite videos, years later of course. Bless Bobby and Sonny, what wonderful music they have given us. Bobby is a class act and always has been. He has done it his way and always the way it should have been done. Bobby used to come in Charlie's shop and tell stories. He is an incredible story teller and was one of the funniest people I have ever met. He was not that way intentionally, but his story telling would leave you laughing so hard. His mandolin playing is far more complex than you may think at first listen. His singing and playing is better now than ever and I am highly impressed with the quality of his work. It does not get any better!!!!! I spent some time with Bobby at the Monroe Style Mandolin Camp this past year and I must echo Joe's sentiments. Truly a class act. Mr. Osborne truly has his own style, yet his music doesn't "all sound alike." He thinks outside the box and does whatever it takes to get the band sound that he wants. There aren't too many who can say that. To me, that's genius. One of my first bluegrass LPs was "Favorite Hymns." "How Great Thou Art" is spectacular, and "Will you Meet me Over Yonder." I have never seen him in person but hope to. Correction: I saw them at the Clear Spring carnival when I was about 10 years old. All I remember is the blue station wagon with the bass on top. Have Vassar's Bluegrass Sessions 1977 in the player, mando chores handled by Statman and Bobby. They do a period-specific White House Blues with some funny lyrics. Bobby nails it. Great interview and I agree too short of answers. As far as the proto type Osborne Gibson mandolins I knew of 2 that were for sale at Gruhns about a year ago and I know of another one in private hands and they all had "Bobby Osborne" truss rod covers. Osborne's Fern was thought to be a 1925 model but much research has taken place since he bought it in 1954. Most Gibson historians are calling that batch of serial numbers to be closer to 1928. F5s of the mid to late 20's are hard to date as are the banjos and guitars of the same era. Noting the anniversary of this interview with Bobby from 2011.